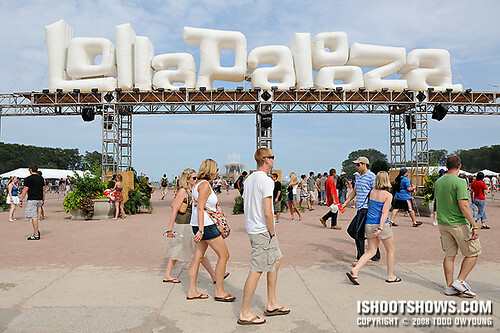 August 1-3, 2008 – 225,000 fans, 90 bands, 10 bottles of water, 8 stages, 3 days, 2 flights, and 1 “suntan” later, Lollapalooza 2008 has come and gone. Headlined by the troika of Radiohead, Nine Inch Nails, and Rage Against The Machine, this year's festival marked a three-day sellout, with attendance of 75,000 music fans flocking to Grant Park in the heart Chicago. I photographed a modest 19 bands over the three-day festival, including all of the major headliners for the three nights. The latter was actually a somewhat rare feat, especially considering that only 25 photographers were allowed to photograph Rage Against The Machine due to tense security and a heaving barricade. For this festival I shot with the Nikon D3 and the new Nikon D700, which share the same newly developed 35mm sensor. For lenses, I brought the Nikon 14-24mm, Nikon 24-70mm, and Nikon 70-200mm, the trifecto of Nikon's f/2.8 zooms. The gear performed flawlessly. One great aspect of Lollapalooza, aside from the shotgun-convenience of photographing so many bands in one short span of time, was meeting other photographers. It was a pleasure to meet and hang out with music photographers whose work I'm familiar with. It was also a very pleasant surprise to meet a number of folks who read ishootshows.com. I've already posted the image set from Radiohead and a few teasers, but stay tuned for the full sets for NIN, Rage Against the Machine, and many many more from Lollapalooza. PS: If for some reason you just can't wait for more, the new September issue of Rolling Stone features a small shot of Chan Marshall, AKA Cat Power, that I shot at Lolla in the “On The Road' section. Big thanks to Jason “Eagle Eyes” Bergman for the tip off on this placement. Hey Valerio, they’re coming, promise. I didn’t know you were such a Rage fan! Overall, I think Lollapalooza was a great experience. The pits were full without being prohibitively crowded, everyone was nice, and there were a lot of great acts on the bill. Ha, sounds good. Hopefully you won’t have to wait too long, though now I do have lots of new sets from Projekt Revolution! Thanks for the comment, Celso. ps. i got into the Rage show at the Denver Convention.. you think I should risk taking my camera into the pit? As far as Rage goes, I think you should be fine bringing your camera into the pit as long as you hang onto it and use the strap. The crowd probably won’t be as nuts as it was a Lolla. I lost Rage on 1996, it was a rainy day in Rome that July and the organizers didn’t think of covering the stage, who went soaked and concert cancelled! then I lost them, again in Rome, in 2000 I was somewhere else and that was their last tour. They are the only band on planet earth to have reunited and to have not played London! Hey Valerio, I see you’re due for a Rage shoot then! Well, hopefully they will be coming to you soon on their current tour. i just want to know what shows you ended up going to from your list – especially since there were a lot of the same shows listed that I was planning on catching. The Rage show here is free so it might get intense. I got lucky at Lolla cause i ended up right next to the sound stage and had some big guys protecting me from the crazies. Oh, it’s that free Rage show in Denver. Actually, you’re right, it might get a little silly. But I still think you’ll be OK with the Fuji, you can always put it in your pocket, right? I wouldn’t want to be in the crowd with a DSLR when people start going off during “Bulls on Parade” or anything like that. I’ll see what I can do with about the “teaser” shots — maybe it can be a game. Who can name all 19 bands from the thumbnails? so i was wondering – what’s the big difference between outdoor shows and indoor venues other than the obvious low light situation? Big festivals like Lollapalooza are hugely different than an indoor gig with just a few bands. Lighting, security, photogs, pit, access, credentials, shooting technique, equipment, the list goes on and on. Do you have a specific question? Todd, so you went and got the D700 as a second body. All that gear fit in your 7MDH? I have a similar setup and I’m still looking for that “perfect” bag. Also, out of pure curiosity, are you represented by any of the big photo agencies? cheers! Yes, I went with theh D700 over the D300, simply because I wanted to maintain a base “image platform.” Since the D3 and D700 share the same sensor and image processors, it’s a seamless transition to switch between cameras. I can process the files in the exact same manner, which is a huge plus for workflow efficiency. Also, I use my Kinesis bag system when shooting events. Generally, I only use the Crumpler 7 Million Dollar Home for shorter events where I’m in and out. Waiting for the RATM shots! Hey Bobin, that’s great to hear you’re working with RS in India, very cool. That shot of Chan was a nice surprise, I’m glad something from the fest made it out there. I’m curious about how you got the photo pass and credentials to shoot the show (and especially RATM). Were you shooting for a publication?